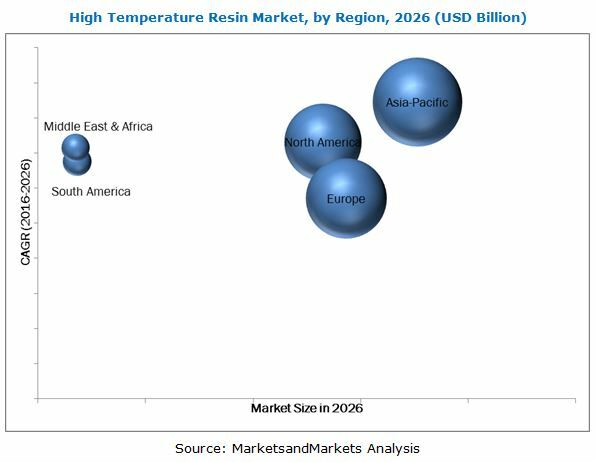 [162 Pages Report] The global high temperature resin market is estimated to be valued at USD 3.16 Billion in 2016, and is projected to reach USD 4.88 Billion by 2026, at a CAGR of 4.44% from 2016 to 2026. In this study, 2015 has been considered the base year to estimate the market size. The report provides the short term forecast for the period, 2016 to 2021, and the long term forecast for the period, 2016 to 2026. This report aims to estimate the market size and future growth potential of the global high temperature resin market across different segments such as type, application, and region. The factors influencing market growth such as drivers, restraints, opportunities, and industry-specific challenges have been studied in the report. The report analyzes the opportunities in the market for stakeholders and presents the competitive landscape for the market leaders. The top-down and bottom-up approaches have been used to estimate and validate the size of the global high temperature resin market and estimate the sizes of various other dependent submarkets. The research study involved the use of extensive secondary sources, directories and databases such as Hoovers, Bloomberg, Chemical Weekly, Factiva, and other government associations. Private & company websites have also been used to identify and collect information useful for the technical, market-oriented, and commercial study of the global high temperature resin market. After arriving at the total market size, the overall market has been split into several segments and subsegments. 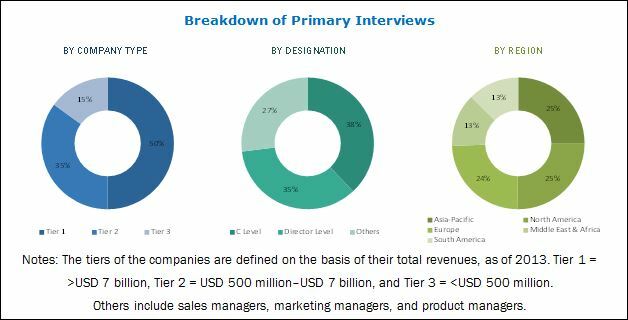 The figure given below provides a breakdown of the primaries conducted during the research study, on the basis of company type, designation, and region. The value chain for the high temperature resin begins with raw material manufacturers of environment-friendly as well as petroleum-based chemicals. These raw materials are procured by resin manufacturers and petrochemical companies. They manufacture different types of basic chemicals, additives, and pigments, which are then sold to high temperature resin manufacturers. The resin is then procured by resin manufacturers, who sell their products to adhesives, coatings, and composites manufacturers. The converted product manufacturers then market their products to molders and end-user companies after receiving regulatory approval. The maximum value is added at the manufacturing stage, as the basic chemicals are mixed and processed with other chemicals to achieve the desired resin for specific applications. Key high temperature resin manufacturers are Solvay S.A. (Belgium), Huntsman Corporation (U.S.), E. I. du Pont de Nemours and Company (U.S.), Hexion Inc. (U.S.), Mitsui Chemicals Inc. (Japan), DIC Corporation (Japan), Henkel AG & Co., KGaA (Germany), Dow Corning Corporation (U.S.), Saudi Arabia Basic Industries Corporation (Saudi Arabia), Wacker Chemie AG (Germany), Royal Tencate N.V. (Netherlands), and BASF SE (Germany). The value chain includes the manufacture of high temperature resin and the delivery of products to the end-users such as, manufacturers of paints & coatings, adhesives & sealants, and composites. This research report categorizes the global high temperature resin market on the basis of type, application, and region. Country-level analysis of the global high temperature resin market by application. The global high temperature resin market is estimated to reach USD 4.88 Billion by 2026, at a CAGR of 4.44% from 2016 to 2026. The increasing demand for the high temperature resin as an alternative to mechanical fasteners in high end applications, growth in application areas, increasing demand for high temperature composite resins in railway and aerospace interior applications, and the increasing demand for thermoplastic resin in composite applications is driving the global high temperature resin market. High temperature resins are those resins which perform normally at temperatures higher than 150˚C. These resins are used in end-use industries where high mechanical performance is required. These include automotive & transportation, aerospace & defense, electrical & electronics, industrial, marine, and building & construction. High temperature resins are used in these industries in the form of adhesives & sealants, paints & coatings, and composites. The market for the high temperature epoxy resins was the largest in terms of volume in 2015. High temperature epoxy resins are widely used for protective coatings due to the superior properties, such as high adhesion, impact resistance, flexibility, chemical and solvent resistance, and others. High temperature epoxy resins offer a unique combination of adhesion, chemical resistance, and physical properties that provide high protection against severe corrosive environments. They are extensively used in industrial applications such as refineries, chemical plants, and marine equipment, such as, offshore drilling platforms, and merchant ships. The Asia-Pacific region is expected to grow at the fastest rate in the global high temperature resin market, in terms of value and volume, from 2016 to 2021. The increasing demand from emerging economies, such as China and India, and the increased sales of high-end vehicles, and electrical & electronics appliances, are expected to drive the growth of the Asia-Pacific high temperature resin market. China, India, and Thailand are major hubs of automotive production, which require the use of the high temperature resin in the manufacture of adhesives for these applications. Currently, China is the world’s largest consumer of the high temperature resin in terms of volume with many leading players investing in the country to establish new manufacturing facilities. The growth of the high temperature resins market in China is driven by foreign investments, cost-effective labor, and the availability of inexpensive raw material. The electronics industry is the largest in the country with double digit growth, annually. Due to the high exports and trade agreements, China’s marine industry is growing at a high rate, which is also a key end-user industry of the high temperature adhesive resin. The high cost of high temperature composites, issues related to recycling of high the temperature thermosetting resin, and regulations related to the use of hazardous chemicals, are inhibiting the growth of the global high temperature resin market. Companies such Solvay S.A. (Belgium), Huntsman Corporation (U.S.), E. I. du Pont de Nemours and Company (U.S.), Hexion Inc. (U.S.), Mitsui Chemicals Inc. (Japan), DIC Corporation (Japan), Henkel AG & Co., KGaA (Germany), Dow Corning Corporation (U.S.), Wacker Chemie AG (Germany), Royal Tencate N.V. (Netherlands), and BASF SE (Germany) are the key players in the global high temperature resin market. The diverse product portfolios, strategically positioned R&D centers, adoption of development strategies, and technological advancements, are some of the factors that enable these companies to strengthen their positions in the global high temperature resin market.